It’s raining hard. Not “hurricane-hard” but “Uh-oh ... there’s going to be street flooding-hard,” if this were in Houston. This has been going on, steadily, for at least a half hour. In the sky, there are tens of thousands of flying insects visible from the Rancho. Their bodies are smaller than black flies but their wing span is greater. That makes them easily visible to me out at least 20 meters – maybe more. How are these little things staying in the air? There can’t be that much space between raindrops. They should be dropping out of the air like ... uh ... flies. I’m going to revise the above estimate. There are hundreds of thousands of them. Where’d they all come from? Now, in the rain, I see a few opportunist gnat catchers flying madly through The Feast. Boink. Rain quit. Insects identified. Termites! And, that tells me where they came from. There’s one big nest, larger than a basketball, affixed to the crotch of a stunted tree at the edge of the sports plaza, maybe 50 m from here. I’ve found several other huge nests down in the lower tree lines. They didn’t all survive the rain. Hundreds are stuck to the stucco. [Hey, is that were the name came from?!?] Thousands of little bodies are floating in puddles – most of them with their wings knocked off. And now the bug eatin’ birds are swarming!. The sky is filled with them but alas for their tummies, most of the termites have gone to ground or back to their nests. You’d think that the energy these birds are expending chasing “flying ants” is way more than they can gain from what they’re able to pluck out of the air. O.K., scholars, here’s today’s challenge. 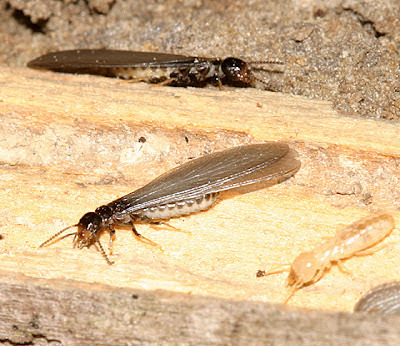 How many termites (average weight and height) does a gnat catcher have to catch and eat per minute to offset the energy expended by flight, plus having some reserves left over (to make it worth the effort)? You may assume a relative humidity of 90% on an air temperature of 25C with calm winds, for your flight calculations. The phone lines are open now for your answers. The first correct answer wins all the termites off the side of the house and mirador. Construction Update: Where are the doors?!?! ?